Tizzard said: "I suppose we were half-expecting that, weren't we, on his last two runs last season and this race last year. We didn't know about the ground, and it clearly is no concern whatsoever. I don't think ground is going to be an issue, whatever we run on. "For me he is a bigger, heavier horse this year. There's no need to change from two miles - although if you ask me tomorrow morning that might change. It was a lovely performance. We have done plenty of work with him - the last thing in the world we want to do is bring these brilliant horses to the races not fit. We make sure that's not the reason why they are beat, but I'm sure he will improve on that. The way he crosses a fence, the way he stays on, he's a two-miler, isn't he?" Asked whether he was concerned about a cut on Fox Norton's hind leg, Tizzard replied: "If you remember he had a cut on his front leg after this race last year and that kept him off for four months. That was a worry. This is just a nick - absolutely nothing. "He will head for the Tingle Creek. It was always Alan Potts' wish that we kept this horse away from [Timico Cheltenham Gold Cup winner] Sizing John. 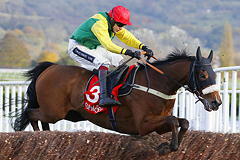 Sizing John still has a chance of winning the £1million [The Jockey Club Chase Triple Crown bonus for winning the Betfair Chase at Haydock, the 32Red King George VI Chase at Kempton and the Timico Cheltenham Gold Cup at The Festival], so that still stands. If he gets beat [at Haydock] and we win the Tingle Creek - he [Fox Norton] is entered in the King George, just in case. "I'm chuffed for Bryan Cooper. He's been under pressure, no two ways about it. Alan decided he was going to ride all the horses in England and I went along with it, but if I'd had my choice, it might not have been. But he's come out yesterday on Finian's Oscar and given him a lovely ride. He was brilliant on this one [Fox Norton] today - no one could have ridden him any better, and I hope we can fill him up with confidence, because he is a good jockey and we can put it out of our minds - there's no reason why he can't ride everything." Trainer Malcolm Jefferson is thinking of a Timico Cheltenham Gold Cup challenge with Cloudy Dream, who finished second in today's Shloer Chase. Sent off at 9/4, the grey proved no match for the 4/5 favourite Fox Norton, who won by eight lengths. The winner is a tip-top horse over today's trip of two miles, and was narrowly touched off in last season's Betway Queen Mother Champion Chase in which he was runner-up to Special Tiara. Today the last-named horse was in opposition again, and after making much of the running stayed on well to take third, inches behind Cloudy Dream. A good run by Cloudy Dream was more than ample consolation for the Jefferson family following an entry mix-up involving the horse at the start of last week. He was meant to be put into yesterday's feature, the BetVictor Gold Cup, but was placed into the earlier longer chase backed by the same sponsor. When the mistake was realised he went into the Shloer Chase. Jefferson said: "As things have turned out I'm happy he wasn't able to run yesterday. It wouldn't have suited him carrying 11st 12lb in a hot race like that on such testing ground. I'm really pleased with the way he's run. His owner [Trevor Hemmings] would like us to think about aiming him for the [Timico] Cheltenham Gold Cup - he [Hemmings] has won the Ryanair Chase." Henry De Bromhead, the trainer of Special Tiara, said: "I'm delighted with that run. He would have hated that ground, and so to run that well on his first start of the season was very good. We'll think about the Tingle Creek Chase or a race at Kempton for him next."